After the investigation process, the NFL has finally made a ruling by suspending Dallas Cowboys second-year running back Ezekiel Elliott for the first six games of the 2017-18 season. The situation is far from over, however. Though Commissioner Roger Goodell has handed down a six-game suspension to Ezekiel Elliott, the drama to decide how much if any part of the season Elliott will miss has only just begun. Elliott has many options as far as how to proceed from here. Under the current collective bargaining agreement between the NFL and the NFLPA, Elliott has three days to decide whether or not to appeal his suspension. If Elliott should decide not to appeal, or fail to inform the league office of his desire to appeal within the allotted time frame, then his suspension will stand as handed down. That’s unlikely, for several reasons. Elliott stands not only to lose valuable opportunities to prove himself one of the elite players in the league by being sidelined, but also significant dollars. 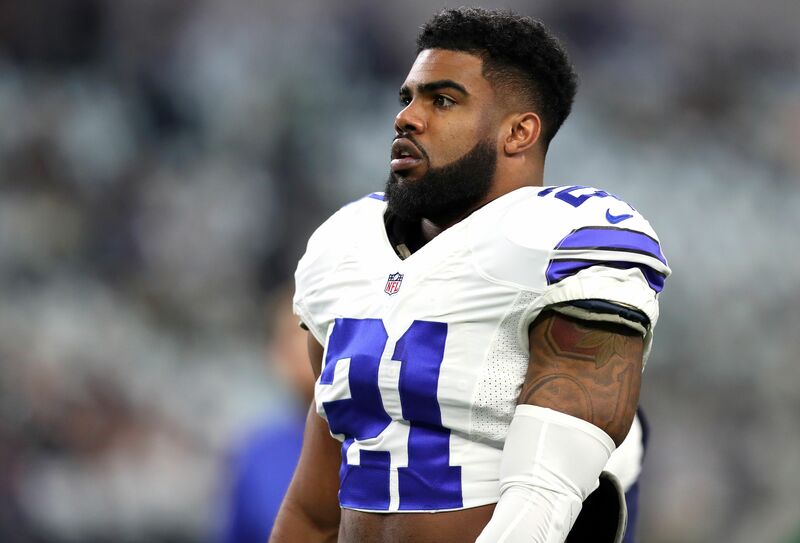 Suspended players not only lose their paychecks for each game they are suspended from, but players like Elliott who have been paid signing bonuses might have to pay back portions of those bonuses as well. Whether or not, including how much, of his signing bonus Elliott would have to repay if this suspension stands would be at the discretion of the Dallas Cowboys. It costs Elliott nothing to appeal the suspension, and until a decision is rendered upon the appeal, Elliott can continue to participate in all team activities as if he hadn’t been disciplined by the league. Assuming Elliott appeals, the CBA dictates that a hearing must be held within 10 days of the receipt of Elliott’s request. The appeal will most likely be heard by Goodell, although the CBA does give him the option to recuse himself and appoint someone else. Passing the job along to another individual would be out of character for Goodell based on what we have seen from his behavior on other disciplinary matters, however. If he sticks to his pattern, Goodell will be deciding on Elliott’s appeal. That’s where the certainty turns into muddled hypotheses. Essentially, the question before Goodell will be whether or not he agrees with himself. There will be many factors in Goodell’s decision, like Elliott’s history of run-ins with the police in several municipalities during and prior to his very short NFL career, the broad language of the CBA’s “conduct detrimental” policy, and legal precedent from the Tom Brady “Deflategate” case which has essentially made Goodell a demi-god in NFL internal matters. Fans need to remember that the NFL isn’t a court of law in the United States. Players aren’t innocent until proven guilty beyond a reasonable doubt when it comes to league discipline. It also isn’t necessary for the league to have indisputable evidence that a law was broken for discipline to be handed down. All Goodell needs is what he considers credible evidence that a player has conducted himself in a manner that is detrimental to the league’s best interests, and he can dole out discipline as he sees fit. Yet, Goodell is an employee of the league’s team owners, one of which is Jerry Jones. While Goodell didn’t let the fact that New England Patriots owner Robert Kraft is one of his bosses keep him from suspending Tom Brady in the Deflategate case, it’s not out of the realm of possibility that Goodell would take into account the fact that keeping Jones happy with him is in his own best interest. What’s also uncertain is how long Goodell would take to make a decision on Elliott’s appeal. With the regular season quickly approaching, there might be some pressure upon Goodell to issue a ruling similarly as quickly in order to allow the Cowboys to make necessary adjustments. If Goodell upholds the suspension or simply reduces it, there is yet further action that Elliott could take to seek relief. Elliott could take a page out of Brady’s playbook and challenge the league’s ability to suspend him in court. He could seek an immediate stay of the suspension, which would allow him to play until the court made a decision. There are a couple of reasons why that may not be the route Elliott takes, however. The first is that a trial regarding Elliott’s suspension would make public all the details of the incidents that provided the munition for the suspension. It’s likely that Elliott doesn’t want all of the potential dirty laundry hanging out for all to see, as that could possibly harm his marketability going forward and provide material for others involved in the incidents to use in civil lawsuits against him. The other reason is that the U.S. 2nd circuit court decision that caused Brady to drop his challenge of the NFL’s Deflategate suspension of him puts legal precedent decidedly on Goodell’s side. Courts have time and again stated that the CBA governs all NFL internal matters, and players that feel grieved should utilize channels afforded by that structure, not the courts. Essentially, the ruling could be that Elliott had his “day in court” when he appealed his suspension. It’s also possible that Goodell could overturn the suspension, which would end the situation but that’s unlikely because of the frequency of Elliott’s misconduct and the public relations nightmare which could result for the NFL. The most likely outcome at this point is that Elliott will miss at least one game, but what’s uncertain is exactly how long it will take to arrive at that end.